Year after year, Latino Art Beat, a Chicago based arts organization, provides students with a national platform to showcase their work to the masses through its visual arts competitions. 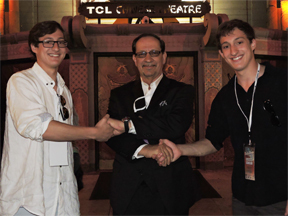 With an audience of over 1,000 attendees, Rossi-Nuccio announced twin bothers, Adam and Daniel Cooper as the winners of the film competition for their film, The Fourth Wall. The Cooper brothers were presented with a crystal trophy celebrating their winning place, along with individual award certificates from Latino Art Beat. They were offered a $40,000 college scholarship, each receiving $20,000. “We know the winners of the film festival are not Latinos. The heart and soul of Latino Art Beat is all about promoting Latinos in the arts, but our overall mission is just to promote youth and give them the opportunity to help them forge ahead with their dreams,” said Rossi-Nuccio. Currently, Adam Cooper is enrolled at Columbia College in Chicago, while Daniel Cooper attends New York University. Adam Cooper spoke to Lawndale Bilingual Newspaper about his overall experience with Latino Art Beat and why it is important to have more organizations that promote youth in the arts. How did you hear of Latino Art Beat and what compelled you two to submit your work to the organization? We heard about Latino Art Beat through the festival after entering. During the course of the festival we learned more and more about this fantastic organization. How have your lives changed since your film debut in Hollywood? 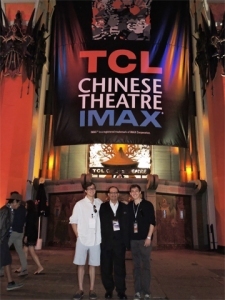 When I’d visit the Chinese Theatre as a kid I never would have imagined that I’d one day see my film play on one of the screens in that beautiful theatre, let alone win an award for a festival there, so in many ways it was definitely more than a dream come true. My life has changed in a couple ways. I’d say my career goals are still the same but its more the path of reaching those goals that I believe have changed; and that path now includes collaborating with Latino Art Beat which I’m incredibly grateful for and excited to see what the future has in store. Talk to me about your film, THE FOURTH WALL. What is the premise of the short film? The Fourth Wall explores a concept that my brother and I have always loved. When a character in a movie breaks the fourth wall they are acknowledging the fact that they are in a movie. This is done in a number of ways i.e. : talking directly to the camera. And it is a strategy used by many of our favorite directors, Scorsese, Mel Brooks, etc. So we thought we could take it a step further… Our thought process: “What if we created a character that discovers he is part of a story and tries to escape by breaking the fourth wall?…what if along the way, he believes he has the power to take over the story he is in…and change the outcome?” We were intrigued so we began writing. What is it about the world of film making that appeal to the both of you? As a kid I was always into magic and illusions and all that. I loved the idea of getting people to believe the impossible. In movies you can show the impossible, you can show what the future will look like, or what its like to fly, and when you have a good story that goes with it, people will believe in what they are seeing and connect with it. I think there is no better illusion than that. In your words describe the importance of Latino Art Beat and what it means to young filmmakers, such as yourselves? Latino Art Beat very actively engages in something that many people just talk about doing. And that is helping young filmmakers achieve their passion. 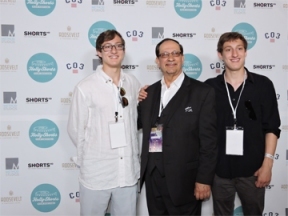 My brother and I, as young filmmakers, speak for all when we say the best two things someone can give to a young filmmaker is exposure, and an opportunity to create more films. This organization has given us both including a generous scholarship which will be used towards perfecting our craft. I am thankful for all young filmmakers who are as lucky as we are to be acquainted with Latino Art Beat.